There are some methods available to change the "Start" button text. There is a small utility too for changing it. But I have seen that the change is not permanent. After a while, the "start" button renames automatically to default one. This is due to file protection of Windows. In some other methods, right-click "search" menu on "start" tab ceases to function. 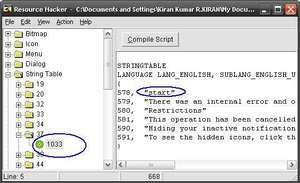 I am giving a safe method to do it using Resource Hacker and Replacer. There will be no problems in this method. 1. Download Resource Hacker on to desktop. It is a small program and doesn't need installation. 2. Go to Tools>Folder Options>"View" tab> Uncheck "Hide Extensions for known file types". 3. Propagate to X:Windows and copy explorer.exe. Paste it on desktop. 4. Open Resource Hacker. 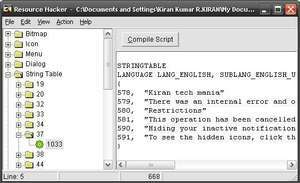 Drag & drop the copied explorer.exe file. 5. In the left pane of Resource Hacker, propogate to "String Table" and select "1033" in 37 sub string. In the right hand side, now you can see a compilation of some strings. The string corresponding to 578 is the "start" tab text. 6. Replace start to desired text. It can be more than 5 characters and can include spaces too. Then click "Compile Script". 7. Now "save" the file and exit Resource Hacker. After saving the file, you will see explorer_original.exe created automatically on desktop. This is a back-up created by Resource Hacker. 8. Now your explorer.exe is ready. You need to replace the original file in Windows directory with this one. You can't copy paste or overwrite the file. Windows File protection system will not allow you to do that. 9. Download Replacer on to desktop. It also doesn't need any installation. It is used for replacing files. 11. It will ask for original file to replace. Drag & drop explore.exe from windows directory. 12. Then it will ask for the new file which will replace the original file. Drag & drop altered explorer.exe from desktop. 13. Confirm the process by typing "Y". 14. It's all done now. Reboot the system and you will see that the start button text is changed.